Internet of Things (IoT), started "buzzing" over a decade ago, when technologists began discussing connecting our refrigerators and washers to the Internet. Today IoT is about connected devices, monitoring, monetizing big data, artificial intelligence, virtual/augmented/mixed reality, manufacturing, transportation, smart cities, and much more. Last week, Technology Association of Georgia (TAG) hosted Georgia's 2nd annual IoT Symposium, in partnership with co-chairs, Dan Foster and Jason Wellman. 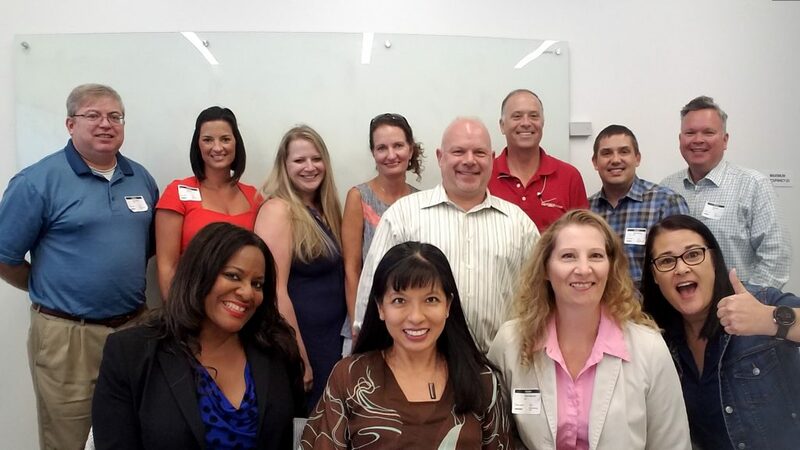 This year, I had the honor of serving as Marketing Chair for the 2017 TAG IoT Symposium planning committee, and worked on an amazing team with Reina Lingle, Sonya Stallings, Gloria Rismondo, Nancy Thompson, Melissa Sorrentino, Ben Cagle, John Whitten, Chris Carter, Ashu Joshi, Todd Peneguy, just to name a few. The most common question I am asked is, "How did the symposium go?" Answer, "Symposium went great, and here's my sixty-second run down of the event." Larry Williams and Dan Foster open the event and thanked sponsors Honeywell, SAP, AT&T, Cumberland Group, Gold, Silver, & Bronze sponsors. Samir Saini, CIO of Atlanta provided a local view of how IoT is powering the smart cities initiative in Atlanta. Tom Raftery, Global VP, SAP, provided a global futuristic view of IoT. 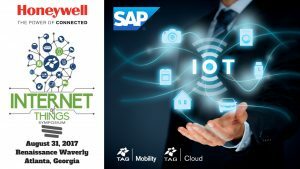 Josh Waddell led a panel discussion with Georgia companies using IoT today in extremely cold and extremely hot temperatures in service, manufacturing, and commerce industries. 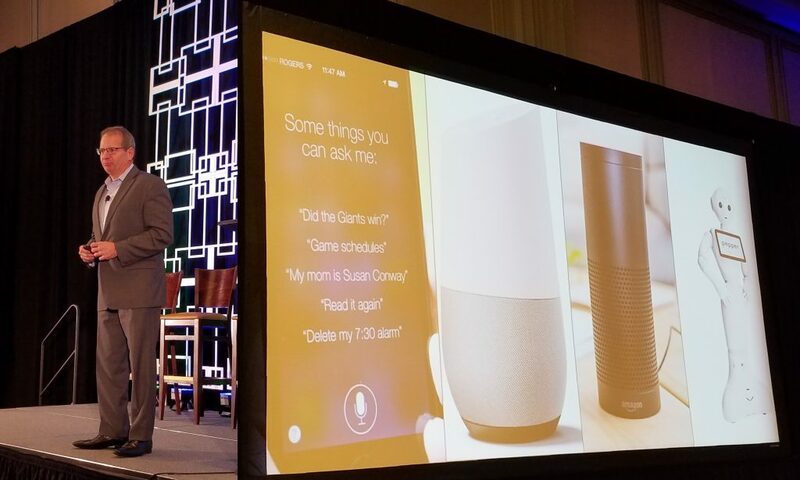 Lunch Keynote from Stephen Gold, VPGM of Honeywell, on top IoT Trends in the Connected Enterprise. Hackathon Winner announcement by John Whitten. Winner is Team Out Loud. Breakout sessions include Product Management / Marketing Innovation, Security & Data Ownership, Connected Travel, Connected Home & Office, Connected Auto & Fleet. All industries can benefit from IoT innovation. Taylor Smith, President, Workflow Solutions, Honeywell Safety & Productivity Solutions picks up where Stephen Gold left off by providing insights into the connected worker, connected workflow, and connected warehouse. Jim Bailey, Global Mobility & IoT Lead, Accenture, presents "Unlocking IoT's Full Value," and how Georgia is currently implementing IoT. 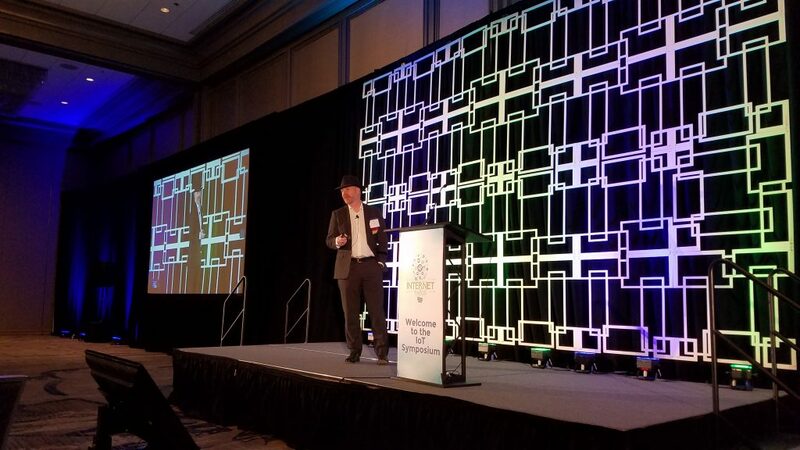 Jason Wellman gives the Call To Action to encourage attendees to lead IoT innovation in Georgia, in the country, and around the world. Here are the five things you need to know about IoT today. There is no industry not affected by digital, according to Jim Bailey, Global Mobility & IoT Lead, Accenture. 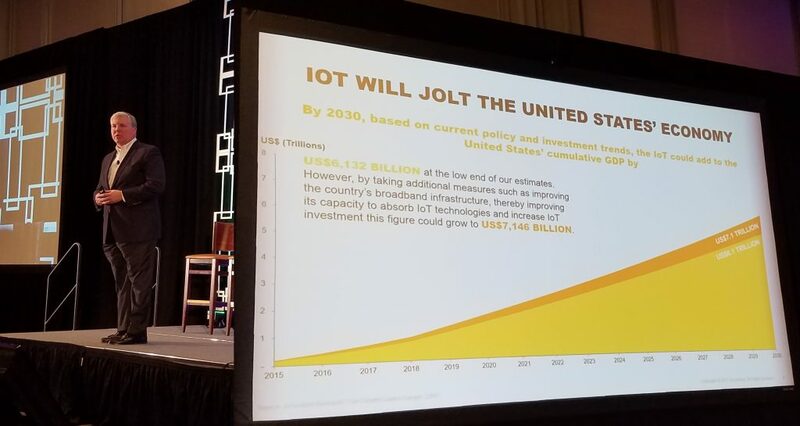 IoT is worth $6-7 billion to the US economy alone. 2. Analytics are the key to IoT, but only 30% of data is being analyzed today. Data is only becoming more unstructured. The amount of data generated per person will reach 5,200 GB by 2020. The next step is predictive analytics which will reduce factory downtime, accidents, and human error. Data Scientists are in greater and greater demand; IoT creates new job titles including that of Tom Raftery as IoT Evangelist for SAP. 3. Tom Raftery predicted that cars would become safer, causing fewer fatal accidents, which will in-turn drive 3-D organ printing. 5. Cities are getting smarter and improving the quality of life for its citizens. 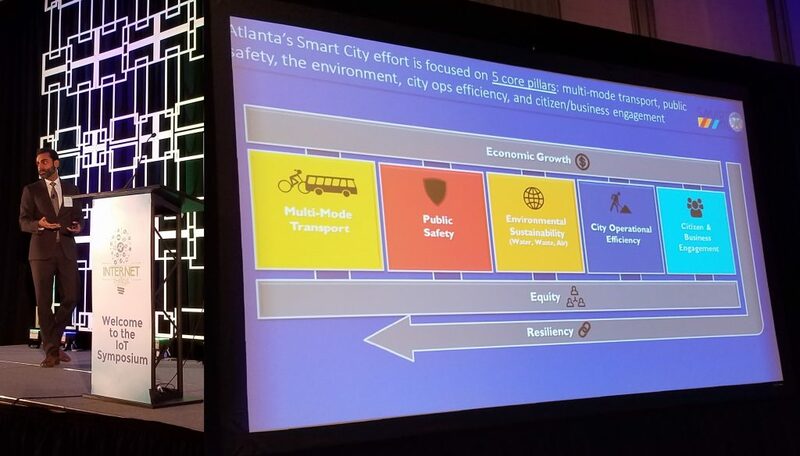 Atlanta is competing in the smart cities race with smart traffic signals, gunfire sensors, recycling sensors, water overflow monitors, and a "living lab" at the North Avenue Smart Corridor. Thank you Dan Foster & Jason Wellman for leading the IoT Planning Committee: Reina Lingle, John Whitten, Sonya Stallings, Todd Peneguy, Nancy Thompson, Melissa Sorrentino, Ashu Joshi, Ben Cagle, Chris Carter, Zevi Solomon, and the TAG team that made this all happen for us: Larry K. Williams, Cara Turano Snow, Mia Jones-Walker, Barbara Martin, Tiffany Stewart, Breanna Lawrence, Crystal Bradshaw, Heather Maxfield, Tony Cooper, and more. Special Thanks to Danny Gonzales and Rica Wiersema from Optimum Productions for creating the slides and recording the event. More IoT Symposium? Yes, please! Join us next year for the 2018 TAG IoT Symposium!